Yes, Booby, snow may fall but does it hang around for long and does it persist or fairly rapidly melt? Watching all those 500 YouTubes has rotted your brain. Bears out what Squire said: AGW will make the more northern states extremely hot due to the long days there. Well, what about the compensating longer nights?? Wettest winter ever then the hottest summer, drying out the growth caused by winter rains, dried it out until it was flammable. Winds spreading the fires. 2. Can’t say there is a month in California where no fire can burn. Talking to a neighbour a while ago and he seemed to reckon Mexico dried out a few decades back: I should have asked more questions! The trend in tropical sea temperatures continues inexorably upward, and high temperatures lead to coral bleaching. Climate change is happening more quickly than many imagined it would. The bleaching event of 2016 may not have been repeated as severely in 2017, but those circumstances will reproduce themselves soon enough, probably during the next El Nino event – these too are slated to become more severe. Scientists are now concerned about how early in the season bleaching has begun this year. Any bleaching events in close succession will kill parts of the reef that are not already dead. Fish face problems from AGW. If the water in their preferred bit of see is too cold they can’t bask in the sun like a lizard and they can’t shed heat if the water heats up. 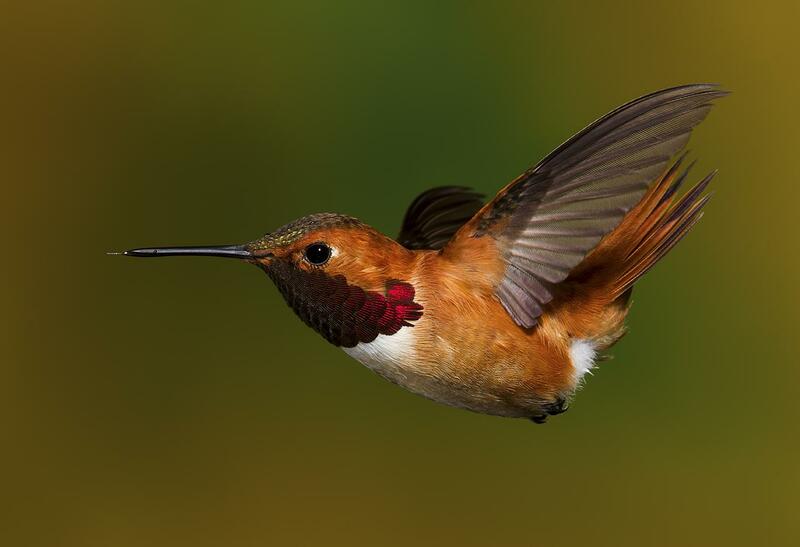 All they can do—migrate. It means fishermen may have to travel further to catch the desirable fish and that means more $$$ and higher prices. A new study from NOAA finds that the incidence of coast flooding along the U.S. coasts (primarily driven by fossil fuel burning) has increased considerably. This already-damaging situation, under present emissions scenarios, is expected to become much worse over the coming decades. I read the Wired article on sea level rise/land subsidence in SanFran, similar obtains on parts of the east coast of the US—balancing the lack of kilometre thick ice sheets means some land rises and some sinks. Holland, of course, is the poster child for land subsidence, being largely a delta plus parts reclaimed from the sea (read up on the Zuiderzee dike) but, due to weird gravity effects and proximity to Greenland is not facing rising seas, not yet anyway. 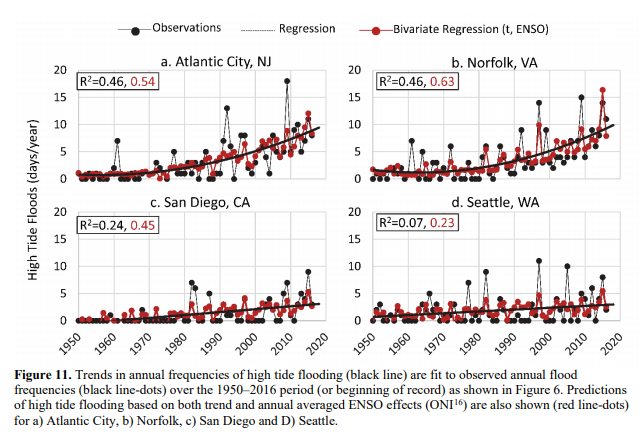 The graphs show the difference between the US west and east coasts (SanFran is a very local effect) with sea level rise zooming on the east coast. One consequence is shortage of water. We know Cape Town is in dire straits but in the US Miami, Los Angeles and others are too. In the case of Miami—the sea is encroaching onto under- and above- ground water sources. In the case of LA—the snow pack in the Sierras is way too low for ensured water supplies. BTW—sorry Pinky—Lees’ claim that glacier retreat/sea level rise is due to adjustment to the Little Ice Age ending is hogwash. The “Little Ice Age” was not really an ice age. Temperatures in the LIA were like 0.5°C cooler than temperatures in the early 20th century. It was felt mostly in England and north east of the USA and likely due to the ending of the Gulf Stream. So, forget about that bit of nonsense. 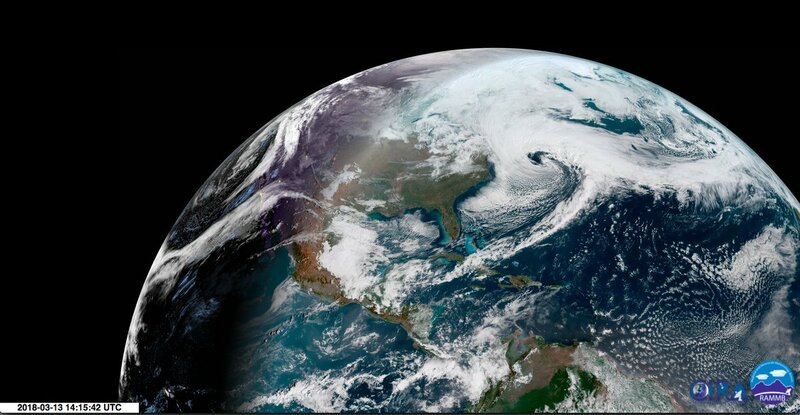 Three major storms, two of which involved “bombogenesis” (a rapid fall in barometric pressure) have hit the NE coast of the US in two weeks. The first produced huge waves which have caused flooding in Boston and other areas—sea level rise is highest off the east coast of the US. We all saw this warmth above 80°N reported. The thick ice off the north coast of Greenland disappeared and was replaced by open water. Open water where the thickest ice used to be! 61 days above freezing in the north of Greenland when the sun had been below the horizon for months! Certainly amazing things were happening! The Gulf of Mexico is several degrees hotter than normal and the Gulf Stream in the North Atlantic is warmer than usual. (As an aside, another dupe on Twitter asked wtte “Gulf of Mexico is hotter by 5°C is there a volcano or vent underneath it?” because they cannot think anymore.) No, there is no volcano or vent under the Gulf! Plain old sun has raised the temperature of the Gulf, jeez! The warm Gulf and North Atlantic nourished the storms, feeding them energy and moisture like the North Atlantic did to Hurricane Sandy that flooded New York and the easternmost hurricane that almost hit northern England/Ireland/Scotland. You can see the patterns in the image above. There is a Jet Stream around Antarctica and that too is being disorganised by AGW and polar amplification. You will need to Right-Click and open the image in a new tab. As I said, a brainwashed dupe asked if there was a volcano under the Gulf. It is a diseased reflex among the dupes to see volcanoes everywhere. Volcanoes are why the West Antarctic ice sheet is sliding into the sea doncha know—and there was a Dubyne silly video on that. Retreating glaciers, the Totten etc on East Antarctica where there are no volcanoes were not mentioned, of course—these are not educational videos, these are brainwashing videos! Anyway, the heat on the seas south and east of the US NE coast are clearly visible. All this heat does not come from nowhere, especially not in the NH late winter to early spring! The heat comes from AGW, the AGW that blocks some infra red frequencies from escaping to earth. The earth is a black body, not a perfect one but perfect black bodies just aren’t found in nature. Come on the night side of the planet and you can’t see it—the Earth does not emit visible visible light part of the EM spectrum. A black body that receives EM energy will emit IR and in so doing cool down. So when the atmosphere blocks some of the IR from leaving the atmosphere the planet inevitably warms up. From comments to the RobertScribbler blog in my previous post. Reminiscent of a stalled pattern causing a five year drought in California. 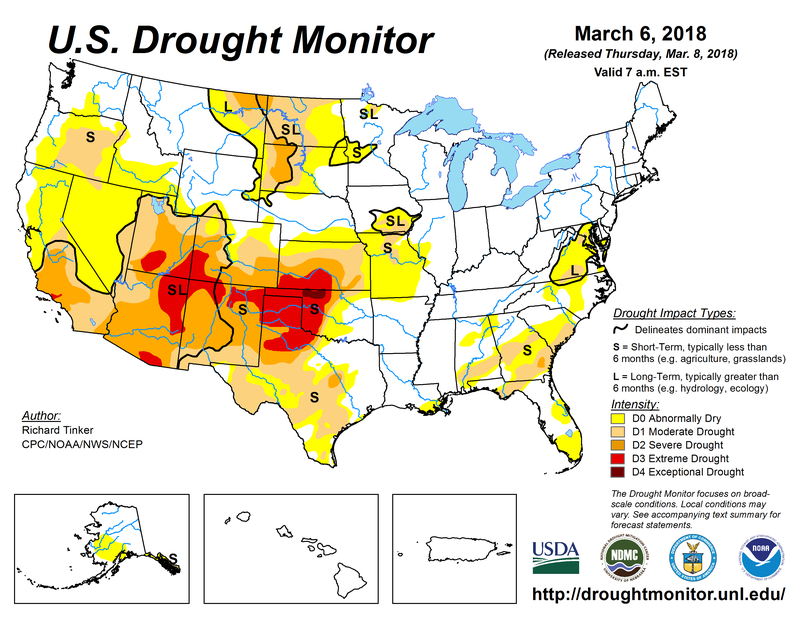 West coast drought getting worse and moving to the central parts of the US. Wildfires—already this early in spring—breaking out is one sign. the situation is now looking a bit worse for the Totten Glacier — an enormous sea-fronting slab of ice as big as France that if it melted in total would, by itself, raise sea levels by about 10-13 feet globally. Previously thought to be more resilient to melt as a result of human-caused climate change and related fossil fuel burning, the Totten was once considered to be stable. 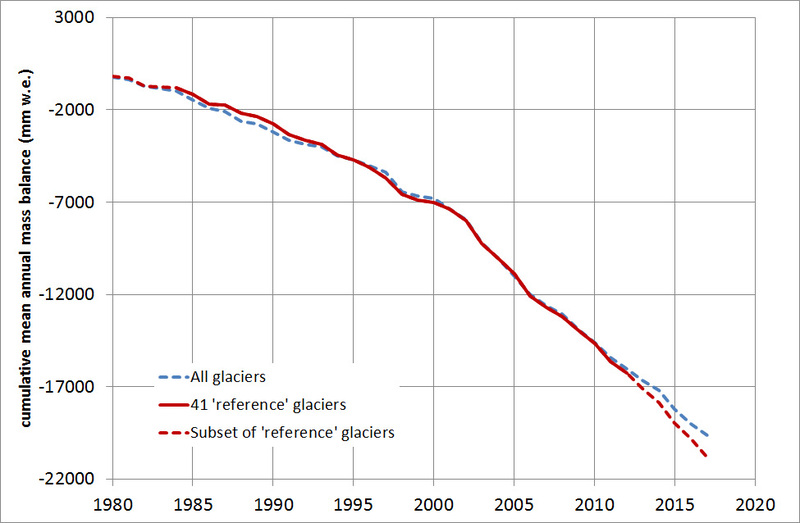 However, over recent years, concerns were raised first when plumes of warm water were identified approaching the glacier’s base and later when it was confirmed that Totten was melting from below. Concerns that were heightened by new research identifying how winds associated with climate change were driving warmer waters closer and closer to the huge ice slab. . . .
Not looking good, is it? One of these giant glaciers—Jacobshavn or Petermann on Greenland, Pine Island and/or Thwaites on West Antarctica or Totten on East Antarctica—give way sea levels will rise by many centimeters very quickly causing havoc in coastal cities everywhere. $3Bn disasters in US in first three months of 2018, exacerbated by rising see levels that saw repeated flooding. 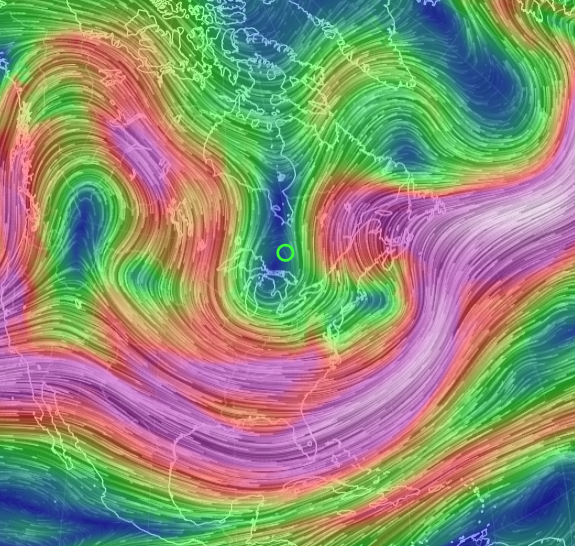 A stuck pattern in the northern Jet Stream sent the storms on the same track to hit the NE US coast. These stuck patterns have seen other series of storms hit the same part of the Earth before. This year has been “anything but ordinary” according to the latest data released by the National Oceanic and Atmospheric Administration (NOAA). In the first three months of 2018, the United States has seen three climate and weather disasters each resulting in more than $1 billion in damages. Two of the four nor’easters to hit the central and eastern U.S. during a one month period resulted in record snowfall and more than a billion dollars in losses each. Millions were without power and hundreds of flights were grounded. Multiple deaths were reported across Connecticut, Maryland, Massachusetts, New York, Pennsylvania, Rhode Island, and Virginia. . . .
. . .scientists know that climate change is making nor’easters more powerful. Nor’easters form when warm ocean air converges with cold terrestrial air. They are more powerful in the winter when the temperature difference is greatest. Climate change is making the temperature contrast even more pronounced, both by warming the Atlantic and by distorting the jet stream, allowing frigid Arctic air to reach further south. Rising temperatures in the Arctic are responsible for reshaping the jet stream. Like with summertime hurricanes, winter nor’easters start in the ocean. And with warmer waters, these storms become more intense. According to Accuweather, this year’s series of devastating nor’easters spent more time forming over the ocean, giving them a chance to increase in strength by absorbing more of the warmer ocean temperatures. This is an interesting article, which contributes to the jet stream and southern oscillation systems effect on climate. The slowing of the world oceans circulation, will lead to catastrophic events, the vast majority of humans won't be able to cope with as they have no fall back system to support them. As the southern oscillation system drives all world ocean currents, dramatic weather patterns will become more and more volatile. read a couple of predictions a few years ago which were rejected and removed from the web after just a few days, because they predicted we are close to 100 years out in the timing of climate change and what was predicted to happen next century was happening now and at much faster rates that thought. The conclusions reached, was by 2020, we would be be seeing uncontrollable weather events devastating areas humans congregate and that by 2030, we may see the demise of over 90% of the current human population. Cities increasingly are creating their own weather patterns, which are getting more devastating each time. When you look at how everyone is approaching the future, not rocket science to see at the rate we are pushing climate change with our destructive ways of living, it's not beyond the realms of possibility. The number of people who have prepared for these dramatic changes, would by just a few millions worldwide, everyone else does nothing, but continue down the path to their extinction. Weather will get more extreme and sea levels will keep rising. But renewable energy prices keep falling and electric vehicle sales are ramping up so there are grounds for hope. It is a pity that now we have Trumpy in Washington and Fizza, captive to the Nats and rabid right wing Libs, in power now. Britain is going gangbusters with RE, building windfarms in the open seas where winds are stronger and more consistent. SA is going to drag its feet on RE under the Lib govt. It will take a major disaster—I predict flooding in the east coast of the US (and Bangladesh but nobody takes much notice of that)—but it could be anything. We are rapidly running out of time! Interesting article that, Dax. The Gulf Stream is something I have been concerned about for a while. I believe the so–called Little Ice Age (not really an ice age) may have been due to a slowdown in the Gulf Stream. Notice how fishery stocks have moved north, staying in the temperature zone that suits them? There is a limit to that, 90°N! A rapid melt of Arctic sea ice and Greenland ice sheet would put a lot of fresh water into the North Atlantic, threatening the survival of some marine populations. Agree with that, there are many other tings which are changing and will have a major impact upon us. At the present rate of commercial fishing, we are seeing a rapid decrease in sea life and when you add the huge changes in ocean current and warming. It will not be long before fish will become very scarce. Used to fish a lot to feed myself, but over the last 10 years, most species in our area have disappeared, or are so small you can't take them. Now we are down to native black back salmon, which are now getting very small and the Atlantic salmon fish farms use massive nets to catch native salmon heading to and from breeding grounds and feed them to their fish farms. It takes 18kg of fish to provide 1kg of farmed salmon. So there is nothing illogical or sustainable in that insane approach. The government dropped catchable sizes for commercial farm operations, so they take all the fish and leave nothing for sea life. To cover the problem,have stocked my dams with trout and installed and aquaponics system, so am not a burden o the natural ocean world. Expect when climate change reaches a certain point, along with over fishing of the seas, we will have many catastrophic events which decimate the ability for us to live and that's just a couple off years away. It will be the same on land, the accumulating effects of our over grazing, chemical poisoning land clearing and most importantly, over population of a very fragile environment. We may well see am almost instant collapse of the essential food chains and ecological stability.